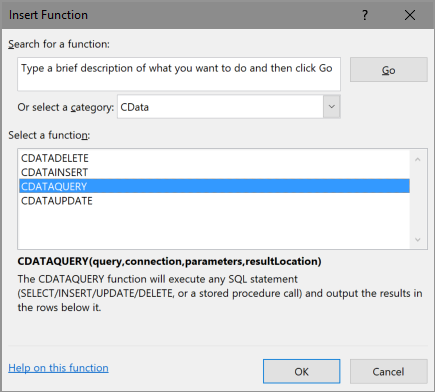 The CData Excel Add-Ins make new data sources available in Excel and enable you to write formulas that use SQL-style database queries. 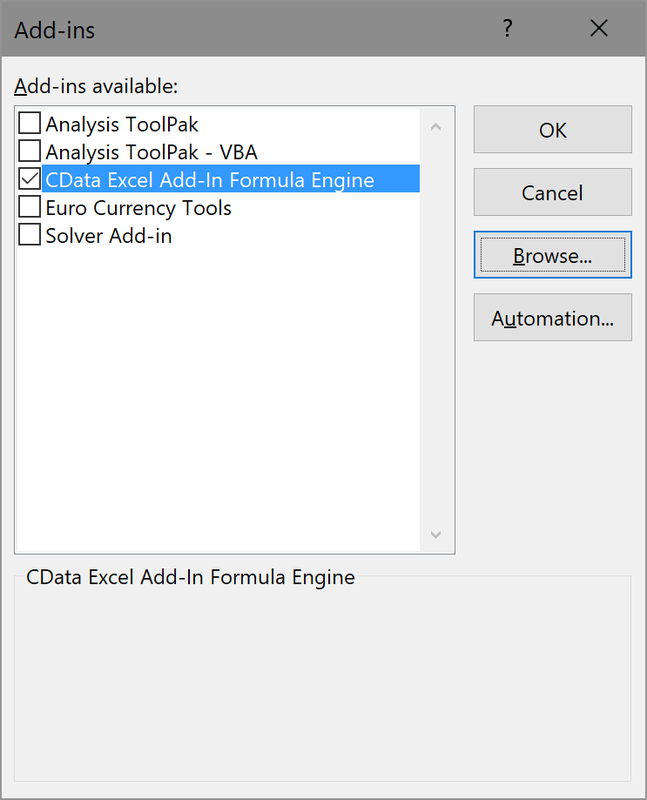 Some users may need to follow these steps to manually add the CData Excel Add-In formula engine. This procedure requires administrator access to your machine. Determine the bitness of your version of Excel: Click File -> Account and then click the About Excel button. The bitness is displayed in the following window. In Excel, click Options on the File menu. On the left pane of the resulting window, click Add-Ins. Select "Excel Add-Ins" from the Manage list and click Go. In the Add-Ins dialog, click Browse and open the Bin folder in the installation directory for the Add-In, then open the 4.0 subfolder. The default installation directory is C:\Program Files\CData\CData Excel Add-in. Select Adxloader.CData.ExcelAddIn.dll if you are running a 32-bit version of Excel. Select Adxloader64.CData.ExcelAddIn.dll if you are running a 64-bit version of Excel. Return to the Add-Ins dialog and in the Add-Ins available list select CData Excel Add-In Formula Engine. 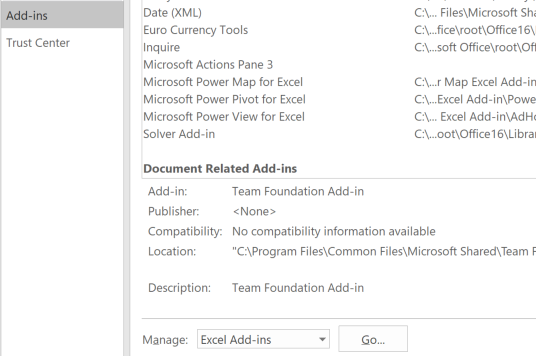 If the manual install has been successful, the CData Excel Add-in Formula Engine is listed under the Active Application Add-Ins list of the Excel Options window. To start executing Excel formulas to your remote data sources, click Formulas -> Insert Function and select the CData category in the menu. Select a function in the list. For formula syntax and examples, refer to the CData Excel Formulas section in the help documentation, under Using the Excel Add-In.